Who knows what evil lurks in the hearts of men? The Shadow knows! The Master of Darkness teams with G-Man Vic Marquette in two never-reprinted pulp novels by Walter B. Gibson writing as “Maxwell Grant." First, an enigmatic message from a dying man leads The Shadow to uncover the strange secret behind “The Ghost Murders.” Then, the Master of Darkness intervenes when “Ships of Doom” are destroyed by a hostile power! BONUS: a Sheridan Doome, Naval Investigator mystery by Steve Fisher. 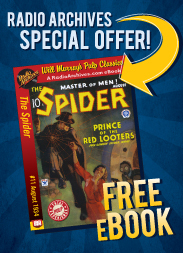 This collectors special showcases the classic color covers by Graves Gladney and George Rozen and also features the original interior illustrations by Tom Lovell and Edd Cartier and historical commentary by Will Murray and Anthony Tollin. "The Ghost Murders" was originally published in the January 1, 1936, issue of The Shadow Magazine. The title conjures up images of a stately old mansion, lightning pitchforks the night sky, and inside unfortunate victims are found lying dead, a frozen look of utter horror on their faces. All victims of the ghost of the manor. Well... sorry, no such thing here. Talk about false advertising! The title “The Ghost Murders” was selected by the editors at Street & Smith for some unfathomable reason. Probably to sell more magazines. When author Walter Gibson submitted this story to his publishers, he had entitled it “The Cigarette Cipher.” And that was much more appropriate. Because that’s what the story is really about: a coded message hidden in a cigarette case. The magazine cover features artwork that is faithful to the story, I should point out. There’s no intent to mislead the reader with the cover. It shows the cigarette case, with The Shadow reflected in the shiny metal case. And in the background is a sheet of paper with the strange code that was found inside the case. So the title, printed on the cover, doesn’t really match the cover art or the story inside. Go figure. Just where, you may ask, did the editors get the idea for the title, anyway? There must have been some connection between the story and the title, even if a vague one. Well... yes. But it is vague. You see, there are murders. So that part of the title does fit. Of course, every Shadow pulp mystery had one or more murders, so that’s essentially irrelevant. The story is good. In fact, it’s very good. So don’t let the fact that the title is a total mismatch for the story dissuade you. Just ignore the title and enjoy another of Walter Gibson’s well-written Shadow mysteries. Gibson loved codes and code-breaking, and featured it in many of his Shadow novels over the years. His love for ciphers shines through in this pulp tale. It’s the major plot point around which everything revolves. The secret of great wealth lies hidden in a coded message, one which only The Shadow can break. When our story opens, we are in Philadelphia at a séance in the apartment of Doctor Mazda. Doctor Mazda is a phony, a thick-set man who wears a black beard and a Hindu turban. He’s working with Madame Theresa, who claims to be a medium. It’s the usual dark room, floating trumpets and messages from the dead. I have to admit that this opening chapter with the phony séance was really cool and along with the “ghost murders” title really sucked me in. But after that, the story turned to a straight gangster story. It’s almost as if the first chapter was tacked on after the rest of it was finished. Perhaps something requested by the editors to make the story fit the title better? I’m just speculating here, but it certainly does have that feel. Anyway, once we get past the séance, the story settles down into an interesting tale of gangsters trying to find the treasure of a fellow kingpin who is currently in prison. Peter Tarmagan is the mob boss who has been sent up the river. It seems that he not only freely spent his wealth, he also had about five million dollars hidden away somewhere. The secret location of his wealth is hidden in his cigarette case. And the cigarette case was given to a trusted associate before he was sent to the big house. The first part of our story involves the search for the missing cigarette case. Oscar Lavery, the man who knows the identity of the current owner of the case is killed, after the information is gained. 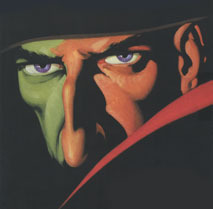 The Shadow is seen at the scene of the crime, and his “ghostly” movements lend shaky justification to the story title. Thomas Farren, the man who carries the much-desired cigarette case, is murdered and the cigarette case is stolen. The Shadow arrives only moments after the crime, and again his “ghostly” reference is witnessed. These two instances seem to be the only justification for the title. Pretty weak, if you ask me. The cigarette case is now in the possession of two notorious killers, Dirk Bardo and Bert Hagrew. They find the secret compartment in the case that holds the coded message that will lead to Pete Tarmagan’s millions. The problem is that they can’t read the code. It’s not that these two are dim bulbs, although admittedly they are, but the code is very unique and extremely complicated. So they go out and kidnap a code expert, one Professor Curtis Fribbs. They intend to force him to break the code. Clyde Burke, reporter and agent for The Shadow, is captured by Bardo and Hagrew and kept prisoner along with Professor Fribbs. The Shadow has to break the code before Professor Fribbs does. Otherwise, the crooks will get the treasure and the Professor and Clyde Burke will die. But it’s a tough code to crack. It’s composed of a series of strange rectangles with diagonal lines inside. And it will take all the mental abilities of The Shadow to solve the mystery before more men die. There’s a lot going on in this story. At first, it seems to jump around a bit, from location to location. Each location involves different characters who are seemingly unconnected to the others. But gradually, it all pulls together and the pieces begin to fit. And by the time you’re done reading this, it all makes sense and reaches an exciting climax. Not only does The Shadow get to use his favorite disguise as millionaire Lamont Cranston, but he also gets to use another of his disguises, businessman Henry Arnaud. We are told that it’s Henry Arnaud who has contacts at radio station WNX, which is how The Shadow is able to get his secret messages broadcast to his agents. These are the messages, you may remember, which appear to be innocent commercial announcements. But the radio announcer stresses certain words slightly, which give listening agents a secret message from their master. And speaking of The Shadow’s disguises, we get to see him grab mop and pail, and dress up in overalls to take the part of the police station janitor Fritz again. Poor Fritz. He’s made fun of, and is openly described as “mentally backward” and a “sluggish moron.” Pretty insensitive in today’s more politically correct world, but things were different back in the 1930s. Keep in mind, this wasn’t just a false character created by The Shadow. There was a real Fritz, and The Shadow was just adopting his guise in order to infiltrate police headquarters. Poor Fritz gets no respect. And let’s not forget The Shadow’s amazing ability to imitate the voice of others. While the art of imitation was more widely used by Doc Savage in his own pulp adventures, The Shadow also demonstrated this ability upon occasion. In this story, he quite successfully imitates the voice of Doctor Mazda. You’ll recognize a lot of familiar characters in this story. Police Commissioner Weston is present, as is Detective Joe Cardona. Vic Marquette, formerly with the secret service, now represents the Department of Justice and helps out with the search for Tarmagan’s millions. And most of The Shadow’s agents get parts in the story as well. Harry Vincent, Clyde Burke, Burbank, Cliff Marsland, Hawkeye, Rutledge Mann and Moe Shrevnitz all show up here. There are lots of those wonderful touches that are always found in the mid-1930s novels. The Shadow’s autogiro shows up, as he takes a quick trip to the small town of Mountainside in search of the cigarette case. The tiny phial of purplish liquid appears when The Shadow administers it to a dying man to give him strength for a final gasping statement. And we take a trip to the seemingly abandoned “B. Jonas” office where Rutledge Mann drops off messages for The Shadow. That strange clock that sits in The Shadow’s sanctum is briefly mentioned. No details are given this time; it’s just described as “a curious clock on The Shadow’s table.” But long-time readers recognized it as the most strange clock that was more fully described in 1933’s “The Red Blot.” And it’s good to see that the clock hasn’t been forgotten three years later. A minor touch but one that’s appreciated. One of my long-term complaints about many of The Shadow pulps involves the seemingly casual disregard for the proper disposal of expended firearms. 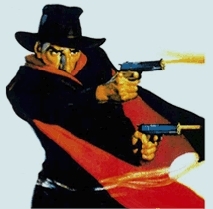 In the heat of battle, The Shadow often empties his twin .45 caliber automatics and then tosses them aside and pulls another pair from beneath his cloak to continue the gun fray. Later, after the battle, he never goes back to pick up the empty guns. This happens consistently time after time. I complain about this, not only because it’s economically inefficient—this could rapidly get quite expensive—but it’s socially irresponsible to leave firearms lying around for just anyone to find, especially children. Well, happily in this story, The Shadow doesn’t discard his expended weapons. To quote: “One brace of guns exhausted, The Shadow dropped them beneath his cloak and pulled another pair.” Thank you, Shadow. It’s about time! This is a prime example of mid-30s Shadow storytelling by the master, Walter Gibson. Now, if you start reading this story because of the title alone, you are bound for major disappointment. It’s a great Shadow pulp novel from 1936, but it really has nothing to do with ghost murders. Don’t let the title mislead into expecting something that you won’t get. If, however, you read it for the joy of experiencing one of The Shadow mysteries from its prime era, then you are in for a treat. It’s got secret codes, gangsters and all the other trappings you come to expect from one of the top pulp series of all time. "Ships of Doom" was originally published in the November 1, 1939, issue of The Shadow Magazine. Oceanliners that are doomed. The pride of the seas—but every one a death trap, doomed to a watery fate. Or a fiery fate. Or worse! Why are these vessels doomed? It takes The Shadow to find out. This was a fun romp with The Shadow with some war-time overtones. Just overtones, though, not a war theme. The Shadow doesn’t fight the Nazis. No, it’s more of a story of corporate greed among shipping lines. But in the background is the European war that would soon engulf America as well. And a certain unnamed Power has supplied a pirate submarine, which The Shadow must confront. So, although I would have preferred an all-out battle against the enemies of democracy, it still made for a fun story that I can recommend. Ships of Doom! A great title. The first ship to meet its doom was the Salvador. It was built in Balthania, a country under the sinister control of an unnamed European power. Yes, this story was written at a time when war fears burned hotly across the globe, and although it was Street & Smith’s policy not to specifically name actual countries, there’s little doubt that the mythical nation of Balthania was under not-so-mythical Nazi control. All the ships of doom were built in Balthania. The Salvador has been sunk upon its maiden voyage. Explosions have wracked the ship and it has gone down with, luckily, few lives lost. Although built in a foreign land, the ship was the property of American owners. Owners who were building a good-will fleet to link the United States and South America. There are currently two other new ships in the fleet: the Nicaragua, currently being outfitted for service, and the Guatemala, currently crossing the Atlantic to join the fleet. The Shadow is on the job. Following his own leads, The Shadow attempts to save the Salvador just before it explodes and sinks. He flies to the tugboat on his autogiro, dangling on the underside of the airship and drops to the deck with the skill of a trapeze artist. But aboard he finds a crew of cutthroats intent on preventing him from reaching the Salvador. And indeed, they succeed in delaying him long enough for the ship to explode and go to a watery fate. There are still the two other ocean liners. Will they also fall to a fate of doom? What purpose lies behind the ships of doom? Who is the hidden mastermind? Only The Shadow can reveal the true secrets behind the ships of doom. Only The Shadow can unmask the sinister power behind the evil plot. And only The Shadow can save the thousand innocent lives at stake in this rousing wartime tale of intrigue and danger. Assisting The Shadow in this tale are federal man Vic Marquette and inspector Joe Cardona. The Shadow’s aides appearing are contact-man Burbank, long-time agent Harry Vincent, investment broker Rutledge Mann, taxi-driver Moe Shrevnitz, reporter Clyde Burke, strong man Jericho Druke and pilot Miles Crofton. And The Shadow himself appears in disguise as Lamont Cranston, wealthy clubman and world traveler. It’s interesting to note that Moe Shrevnitz varies the sets of lights on his taxi-cab in order to create the illusion that it is different vehicles. In this way, he can more easily trail suspects without giving himself away. In other stories, we are given descriptions of other methods he uses to make the cab change references. But in this story, the method used is varying his lights. Since the introduction of Margo Lane into the series would be a year and a half away in the future, the need for a female proxy hero is filled here by Janet Myland. She’s a plucky young lady who gets involved in the case because of the Disappearance of her fiancé. She originally challenges The Shadow, thinking him to be part of the evil plot, but eventually becomes his aide. This is a role that could easily have been taken by Margo Lane, and in later stories, would be. Harry Vincent gets a small taste of what it’s like to be The Shadow in this story, as he gets to don the costume of black and battle it out with a hoard of gangsters. He appreciates the advantage of the fear produced by the costume. But he also realizes the disadvantage of being the number-one target for the entire mob. An interesting turn-about for one of The Shadow’s agents. The rousing climax takes place on the water with The Shadow taking on a German U-boat in a small cabin cruiser. It’s not specifically identified as a German submarine, but again there’s little doubt which “Power” owns the undersea vessel. Your blood will race when you read this thrilling final chapter of the ships of doom. Although some of the middle sections of the story tend to drag a bit, the thrilling end really helps make up for the rest. It makes for a rousing good time. It’s a story I’m glad I didn’t miss. This one was also a beauty. And as always the service was speedy and professional. Thanks so much!